There are serious allegations that the German Journalist Billy Six against the Federal Foreign office (AA). "You wanted me to die," said the 32-Year-old on Tuesday. Six, writes for right-wing conservative media, such as the "Young freedom", sat for four months in Venezuela in prison, among other things, because of Rebellion, espionage and Violating security zones. On Monday, he was landed back in Berlin. His father, Edward, Six, said the Federal government was the main responsible for the imprisonment. The Foreign office had not protested against the detention. He announced a lawsuit against the Federal government. But the case is complicated. The Federal Foreign office represents the situation entirely different. A spokeswoman says: "The German Embassy has used from the beginning for Billy Six's release and it engst care possible." In total there were four prison visits – one of them from the previous German Ambassador, Daniel Kriener. This had been protested in November, when the Venezuelan foreign Ministry against the arrest. Six,' father referred to this as a "lie". That Six was free, he especially thanks to the AfD. In the right circles, Six’ detention for months duration issue. In a survey conducted by the Federal government under the AfD Deputy Jürgen Braun, foreign Minister, Heiko Maas, was, that it was not in the "spirit" of Six, that the Foreign office take care of. Maas rejected the with reference to the efforts of the Embassy. Germany's relations to Venezuela, however, are heavily loaded. In March, Ambassador Kriener leave had to, after he was declared undesirable Person. The government of Nicolás Maduro, accused him of partisanship for the self-appointed interim President, Juan Guaidó. How exactly is it then, on the release of Billy Six, is unclear. The AfD Deputy Petr Bystron says, he had used his contacts with the Russian foreign Minister, Sergey Lavrov, to move it to Six. Lavrov had then in Vienna for talks with his Venezuelan counterpart on the release. This is also the representation, the common father of Six. The AA said on Monday but, by this process, it had "no knowledge". 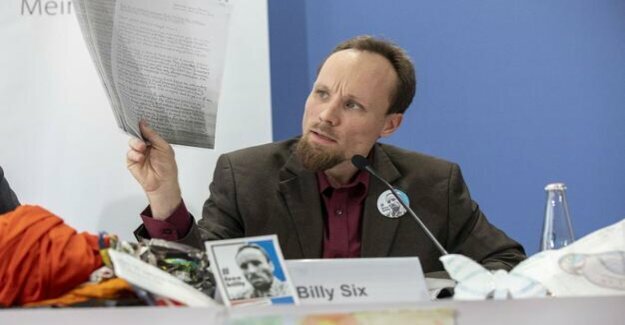 Billy Six admitted at a press conference that he had been without a journalist visa in Venezuela. He had researched the mass Exodus of Venezuelans who are leaving due to the supply crisis in the country. The organization "reporters without borders" believes that his journalistic activity was the reason for his imprisonment. The espionage allegations against him were "outrageous". Six reported since 2017 from the Region. In addition to the "Young freedom", he writes, the "Deutschland" magazine, which is published by the radical right club, "German Conservatives". This has sent him, according to reporters without borders to Venezuela. In prison, suffered Six under Dengue fever and the unsanitary conditions. He was most of the time in Isolation. Years ago, he had been already once before in Syria in prison. They had accused him of illegal entry and terrorism.